When in Rome do as the Romans do: eat traditional local dishes. Roman cuisine is famous for its simplicity and “nothing goes to waste” philosophy with local cooks turning the most humble ingredients into unforgettable creations. Here is a quick pick of the best traditional dishes to eat in Rome. The real carbonara is light, flavoursome and more-ish. Forget about the heavy pasta dish with a rich cream sauce that you might have been fed outside of Italy. The real pasta carbonara requires a raw egg sauce with guanciale or pancetta, seasoned with black pepper and pecorino Romano cheese. Simple and delicious, it is the essence of Roman cooking. Another simple Roman classic you need to try while visiting the Eternal City is cacio e pepe. 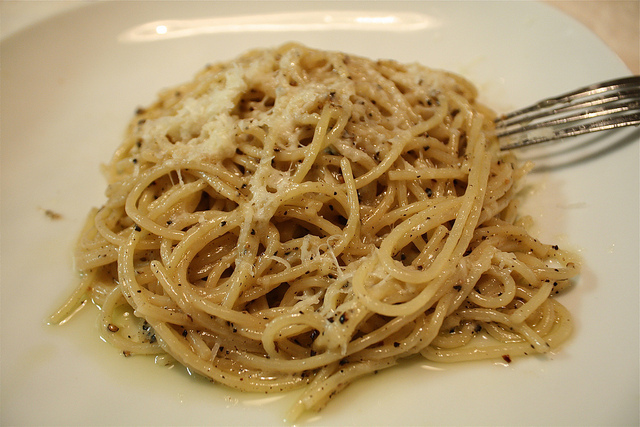 The pasta, cooked al dente, is dressed with pecorino Romano cheese and fresh black pepper. The secret of a creamy dressing is a small amount of the cooking water from the pasta that is added to the seasoning. Not for the squeamish, this dish is made with tripe cooked slowly in a rich tomato sauce till it is soft and buttery. Its pungent note is emphasized by generous amounts of pecorino Romano cheese that the dish is served with. 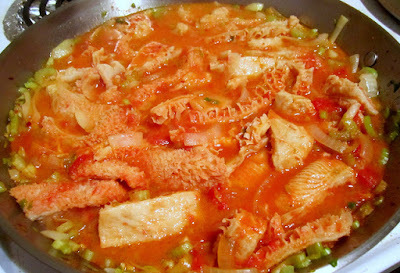 Any local will tell you that the best trippa alla romana can be found in small trattorie in the Testaccio district. Roman cuisine features many Jewish dishes, with Jewish-style artichokes being one the most popular of them. 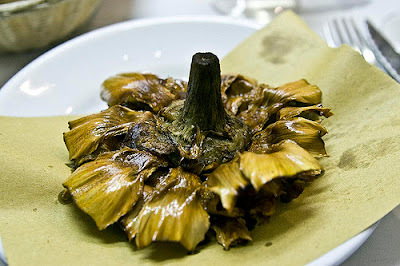 Roman artichokes are deep-fried to a light crisp perfection, nothing else is added. The best time to taste carciofi alla giudia is from February to May when they are in season. For the most authentic taste head to one of the restaurant in the Jewish Ghetto district in Rome. One of the best Roman dishes, this is a heavenly treat for meat lovers. Slices of veal are wrapped in prosciutto and sage, marinated in white wine and fried just before being served. In Roman dialect “saltimbocca” means “jump in your mouth” and you will definitely jump with a delight after having tasted this tender fragrant dish. Photos via Flickr by: Naotake Murayama, Amy Ross, Young Sok Yun.